The Schwinn Airdyne AD6 vs Assault Air Bike go up against each other in this head to head comparison of two of the heavyweight bikes. These two bikes are both made with the serious athlete in mind. The very big question is whether the extra money for the Assault Air Bike is worth it for better features, performance and durability. The bikes are similar in many respects as you’d expect with them both being fan bikes that use a fan wheel for air resistance and having moving arms to give the ability for some of the most intense exercise you can get on an exercise bike. 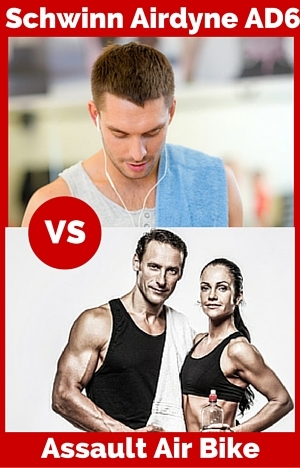 There are differences and they could make the difference to you as to which one is best to achieve your fitness goals. The Air Assault bike has definitely been built to be durable and stand up to the pressure of hard workouts by serious athletes including elite ones. It doesn’t come with any accessories as the focus is on delivering on the basics for tough workouts and conditoning. It is possible to buy accessories separately. You can adjust the seat upwards/downwards and forwards/backwards to have the bike properly fit you for your size (most fan bikes only allow you to move the seat vertically). Customers are impressed at how sturdy and well built it is put together making it a popular bike even though it is high priced compared to other bikes available for the home. You definitely can get a workout that can test you to your physical and mental limits if you want or you can take it easier for rehab and for generally getting in shape or staying in shape. You can read my full review here. The Schwinn Airdyne AD6 is a basic fan bike that comes with a water bottle holder and simple console. You can buy a wind guard or book holder separately. You can train the whole body or isolate the upper or lower body. When you want to just train the lower body you can place your feet on footrests to keep your legs out of the way of the feet. On the whole customers are happy with the bike for it sturdiness and stability. As you can’t move the seat forward or backwards some people have found themselves cramped or over stretching to move the handlebars fully. Drive. The Air Assault has a chain drive and the AD6 a belt drive. A chain drive does require more maintenance than a belt drive. It isn’t a lot of maintenance – it involves lubricating it and adjusting the tension as required as you might do with a road bike. This doesn’t need to done by a specialist. Whereas the belt drive, which is quieter and smoother, will eventually (after a number of years use) stretch and need replacing which odes need specialist skills and tools. Workout Programs. Although it doesn’t have programmed workouts (as such) the Air Assault console allows you to quickly set the timer for tabata, reverse tabata (10 seconds work, 20 second rest for 8 rounds), set your own intervals and set targets. Seat Adjustment. The Air Assault bike seat can be adjusted horizontally as well as vertically. This enable to get a more comfortable and effective position for working out, It avoids being stretched or cramped when working the arms on the handlebars. Fan. The fan of the Air Assault bike has metal blades whereas the AD6 has plastic blades providing a more durable solution and some users note that it provides more resistance. Noise. The metal blades on the Air Assault Bike seem to be noisier than the AD6 fan. It is not very noisy but is louder than an electric fan on full, so is more likely to disturb others sleeping in the house if training first thing in the morning if they are light sleepers. Accessories. The AD6 comes with a water bottle included but with the Air Assault bike this has to be bought separately. Pedals. The pedals with the Airdyne AD6 has straps to hold your feet on the pedals. The pedals for Air Assault bike only have the pedal as you get with a road bike. Console. The Air Assault bike has a lot more functionality. In addition to measuring RPM, distance, speed, calories burned and heart rate (when strap supplied) it measure watts. You can also set tabata, reverse tabata, own time intervals and goals. It is a much more functionalitty, better looking console and easy to use. Warranty. In spite of the engineering that has gone into the Assault Air the Schwinn AD6 frame warranty is 10 years longer at 15 years. Area. The area needed by both bikes is similar with the Air Assault 1 inch longer at 51 inches and the Schwinn AD6 2 inches wider at 26 inches. Calories. Calories between the bikes are now more or less in line with each other previously the Assault was counting calories at half the rate of the Schwinn. The Assault Air Bike is $440 more than the Airdyne AD6 when I checked for the best pricing online. If you have the budget for it then the Air Assault is an excellent choice because of its’ quality of build that will take anything you can throw at it. It is used by CrossFit gyms as well as the military across the country and has shown it can stand up to the punishment. It also has a great console. However, if you’re budget doesn’t stretch that far then the Airdyne AD 6 makes a good second choice. It is not as well put together as the Air Assault bike but most people find it can cope with anything they can throw at it and the frame does have a 15 year limited warranty (much longer than the Air Assault). In the table below I’ve got all the features, dimensions and accessories lined up next to each other to give a quick comparison of the two bikes. I hope this information here has been useful to you and you’ve been able to decide on which one is the right one for you after looking through the details here. Please let me know what you think before you get busy on crushing your workout or humbling yourself real quick! Where do I get larger seat for Assult bike ? You should be able to fit a larger standard fitting bike seat for the Assault bike which are avaialble online or at a bike shop. Yes, I need to add the Pro to the comparison. I plan on doing it this month. Thanks for letting me know.